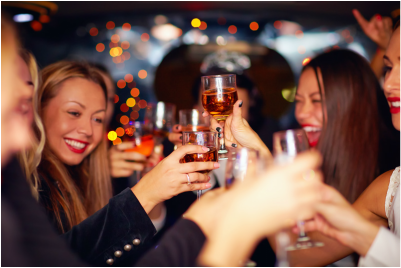 Overland Park Limo Service is your transportation headquarters for the KC Night Life Partying Scene! We pick you up and get you and your friends home safely so that you can enjoy your evening without worrying about losing your license or even worse - hurting someone behind the wheel of your vehicle! Our amazing staff of limousine drivers are well acquainted with the Kansas City Metro area and knowledgable of where the party is happening. Looking to hit up Tanner's Waldo (or any of their other locations for that matter)? We'll get you there! The Quaff? No problem. Our hometown favorite BrewTop? Easy peasy. Howl At The Moon or Hotel Nightclub? With our eyes closed...okay that would be unsafe, but you get the point! Interested in where the after-after-party goes after the traditional clubs shut down? Yup...we've got the low-down on that as well. We love the opportunity to provide safe transportation for our patrons. Yes, it requires thinking ahead to make a reservation... But, the convenience and safety it provides, along with the luxurious accommodations, far outweighs any benefits you might find with a Taxi or Uber. For that matter, who wants to be the last one dropped off by "Creepy Uber Driver" when you've had a few too many and may or may not be completely coherent in the back of their car? Let Overland Park Limo Service get you around town and back to your home safely and luxuriously. We promise we will get you to all of the best clubs and bars, and maybe introduce you to a few new ones as well. Call 913-956-0088 to make your "non-scary" reservation today.